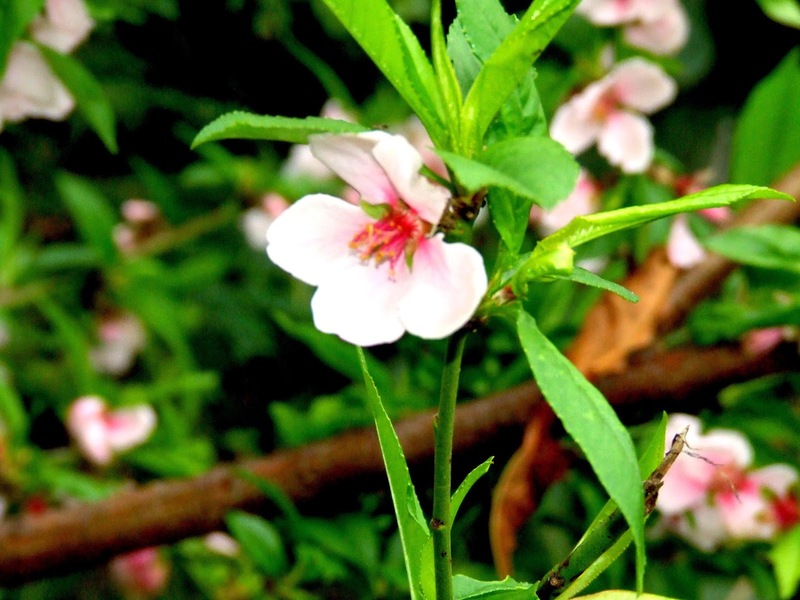 Peach blossoms, golden mustard fields are all harbingers of spring. 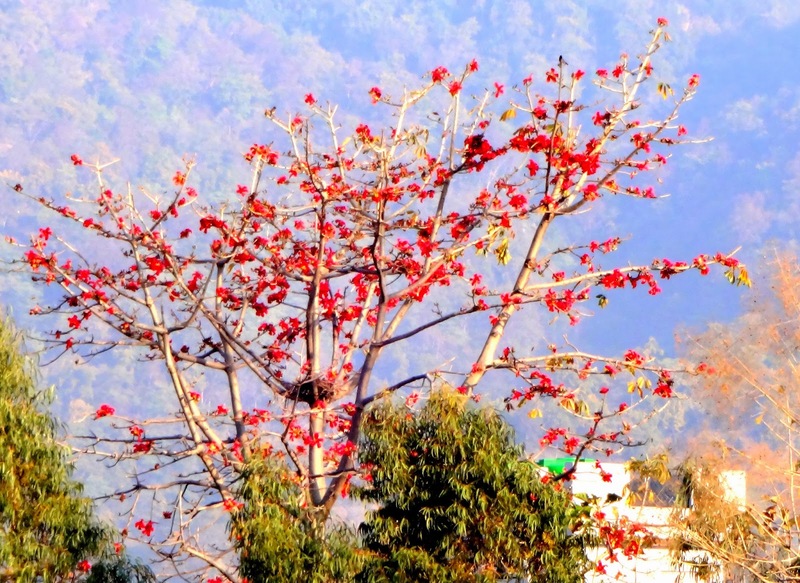 Bunches of Semal (silk cotton tree flowers), mango blossoms, busy bees and rhapsody of birds are the indicators that we are heading for summers. Yes! The festival of colours- Holi is not far away, one can sense the excitement, the zest and zeal that marks this festival. There is something about this festival which is so soul uplifting. 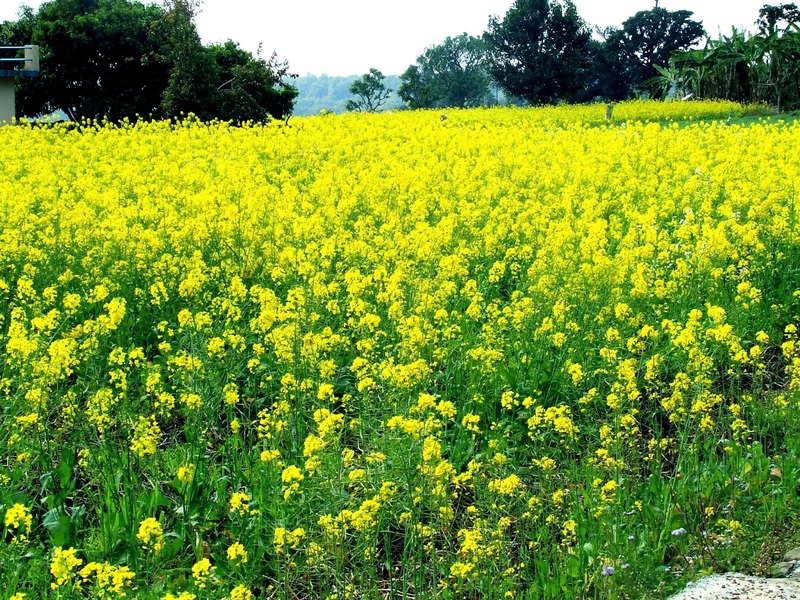 Bright weather, verdant green fields, bright of colours of nature ……..everything looks so fresh, so new, so full of life. Sudden warmth in the weather has been extremely encouraging to bake with yeast. 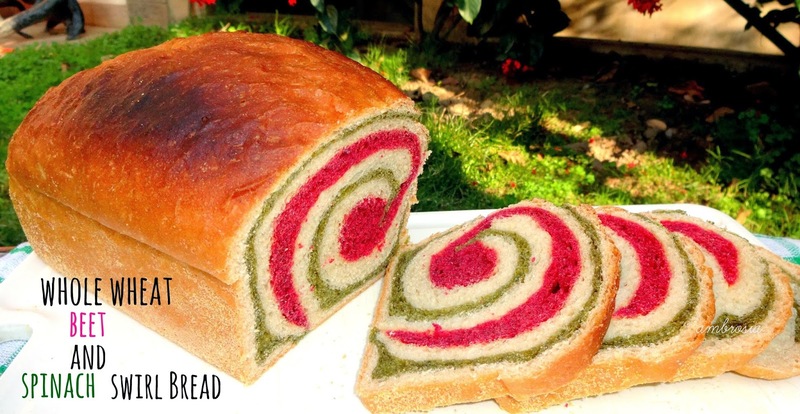 With Holi round the corner, I thought of baking a colourful bread to celebrate the occasion. I used beets and spinach from our garden. I have known so many breads where the nomenclature has been based on specific occasion when they must have been baked - like holiday bread, festive bread, happy bread to name a few. 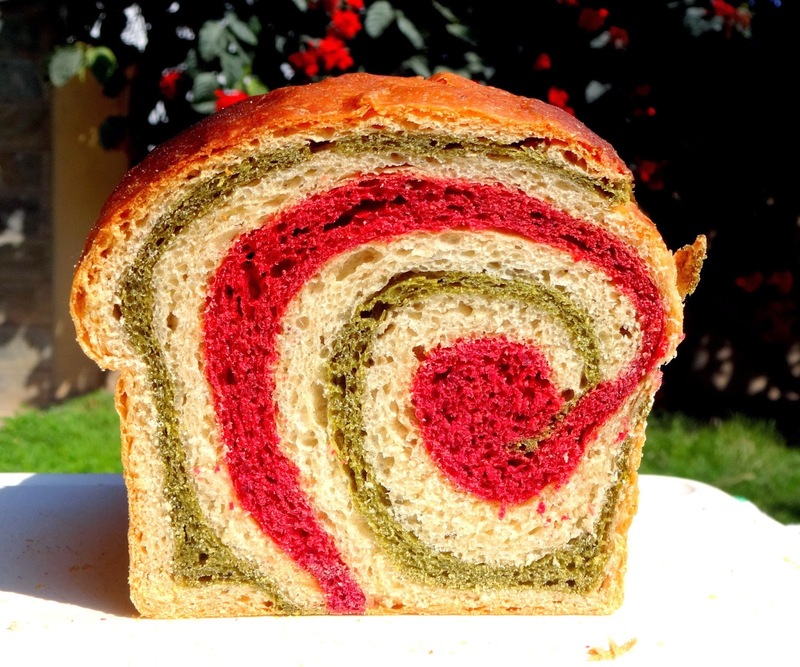 I christened my bread- “Holi Bread” that aptly justifies its colours and the occasion . Combine the first five ingredients in a big size kneading plate thoroughly with hands. Dissolve 2 tablespoons of sugar in ¾ cup warm water. Use this water to knead the white dough and coloured dough if needed. Take beet puree in a bowl, add one tablespoon sugar and leave for sometime till sugar dissolves. Take spinach puree in another bowl and add 1 tablespoon sugar and leave till sugar dissolves. Measure 1 cup of the flour mix and transfer to a plate. Add beet puree and knead. Add warm water if required. Knead for 5 to 6 minutes till a soft supple dough forms. Take 1 cup of flour mix in another plate, add spinach puree and repeat the same. I did not require to add water in this. Add warm water if needed. Knead dough from the remaining 2 cups of flour mix. The dough should be soft and supple. Take dough in three different oiled bowls and turn around the balls of dough so that they are well coated with oil. Cover and keep in a warm place for 1 hour to rise (or till doubled). Punch the three doughs; knead them again for 5 to 6 minutes, separately. Wash hands after handling beet and spinach dough so that the colours don’t mix. On the working counter sprinkle some flour. Divide white dough into two parts and roll the doughs separately into four rectangles about 12 ½ x4 inches each. Place them one over the other in this order- white, green, white, pink. Spatter some water between each layer. Beginning at short end, roll up tightly. Pinch seams and ends to seal. Place the loaf in the greased loaf tin (dusted with cornmeal) with seam sides down. I used a 9x4 1/2 inch pan. Cover and leave to rise in warm place for an hour or till doubled in size. Bake in a pre heated oven at 190 degrees C for 30 to 25 minutes or till the top turns golden and bottom sounds hollow when tapped. If the top browns too fast, tent loosely with a foil. Remove from the oven and transfer to the rack to cool. You are truly an artist Namita. Where else can you see such a spectacular bread. Such an amazing way to celebrate the festival of colours. Stunned at the creativity. Happy Holi to all of you. You did it again, Namita. 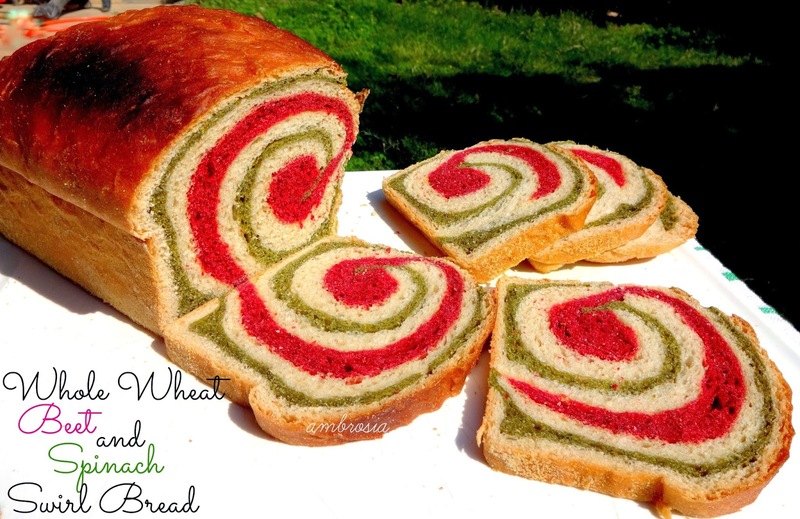 It's so beautiful & O'course must be tasty too.You won't believe I was thinking of making green spinach bread today (for st. Patrick's day here ) but then got lazy & right now olive bread(with green olives) is proofing on the counter. i made this bread yesterday and sliced it today morning . it is beautiful bread but i noticed that some of the slices were bit undercooked . how can i rectify this? please give some tips. Hello Meenakshi, I hope your dough was not too wet. And most important of all, did you use the right size baking tin? If the tin is small, then the bread will not bake well. Please send me your feedback so that I may help you. i am sorry for replying late. tin size is 8.1/5 x 3.1/5 x 3 inches..
Hi Meenakshi, your pan size is ok. Please give another try. Make sure your dough is just soft and supple and not sticky. Also tent your loaf with a foil and bake it for extra 10 minutes. Hope you come out with a beautiful loaf. This is Desy. I baked this recipe yesterday night and I love it! I am just wondering how to get and preserve the beautiful red color from the beet? Mine turned into light brown during the baking process. Is there any tips that I should aware to get the nice red color as yours?